Prince Mohammed and Masayoshi Son at the signing ceremony. Saudi Arabia and SoftBank Group have signed a memorandum of understanding to build the world's largest solar project in the kingdom at an investment of $200 billion, said a report. 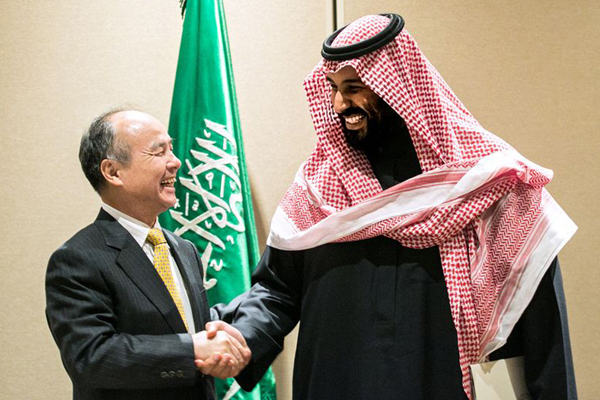 SoftBank founder Masayoshi Son, known for backing ambitious endeavors with flair, unveiled the project on Tuesday in New York at a ceremony with Saudi Crown Prince Mohammed Bin Salman. The powerful heir to the throne of the world’s largest crude exporter is seeking to diversify the economy and wean off a dependence on oil, reported Bloomberg. The deal is the latest in a number of eye-popping announcements from Saudi Arabia promising to scale up its access to renewables, said the report. While the kingdom has for years sought to get a foothold in clean energy, it’s was only in 2017 that ministers moved forward with the first projects, collecting bids for a 300-megawatt plant in October, it stated. At 200 gigawatts, the Softbank project planned for the Saudi desert would be about 100 times larger than the next biggest proposed development and a third more than what the global photovoltaic industry supplied worldwide last year, according to data compiled by Bloomberg New Energy Finance. “It’s a huge step in human history,” Prince Mohammed was quoted as saying in the report. “It’s bold, risky and we hope we succeed doing that,” he added. If built, the development would almost triple Saudi Arabia’s electricity generation capacity, which stood at 77 gigawatts in 2016, according to BNEF data. About two thirds of that is generated by natural gas, with the rest coming from oil. Only small-scale solar projects working there now. Son said he envisions the project, which runs the gamut from power generation to panel and equipment manufacturing, will create as many as 100,000 jobs and shave $40 billion off power costs. The development will reach its maximum capacity by 2030 and may cost close to $1 billion a gigawatt, he stated. “The kingdom has great sunshine, great size of available land and great engineers, great labour, but most importantly, the best and greatest vision,” Son told reporters at a briefing. The kingdom’s deal-making has quickened as it pursues Prince Mohammed’s diversification goals. Saudi Arabia’s sovereign wealth fund, the Public Investment Fund, which has more than $224 billion in assets, spent about $54 billion on investments last year, said the Bloomberg report. The sale of about a 5 per cent stake in oil giant Saudi Arabian Oil Company is expected to provide more funds, stated the report. Saudi Arabia also plans to build at least 16 nuclear reactors over the next 25 years at a cost of more than $80 billion, it added.